Who is coming into my home? Inviting a worker to enter your home can be stressful, that's why I will send only drug-free technicians with no criminal history to your home. Always On Time Electric is family-owned and operated right here in Navarre, FL. Other companies may offer similar services, but our services are the best, and come with a personal touch. Always On Time Electric understands that. We are all about safety, reliability, service and value. When you need emergency electric repair, ceiling fan installation, electrical service upgrades or remodeling, we handle the job in a timely fashion and at a price you can afford. Some electricians charge by the hour and say they’ll be in and out of your home in no time, but when the work drags on… their bill puts a nasty dent in your wallet. That’s not the case with Always On Time Electric. We charge by the job, not by the hour. You know up front what the electrical work will cost before we even start. We will be there long enough to do the best job possible, then, we’re out of your way. 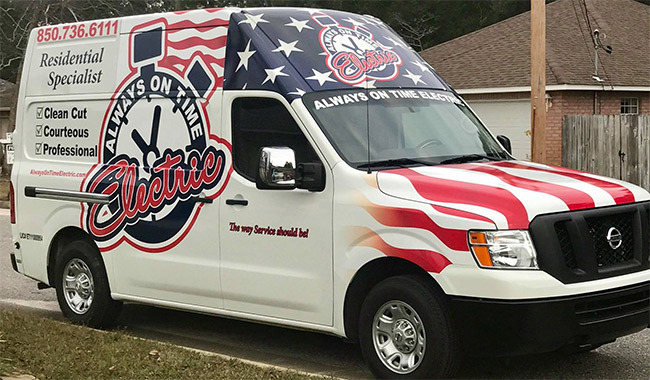 Since 2013, Always On Time Electric has served thousands of customers, providing electrical service and repair for homes throughout the Panhandle including Navarre, Niceville, Shalimar, Gulf Breeze, Mary Esther and the entire Fort Walton Beach area. We are proud to be an accredited member of the Better Business Bureau with an A+ rating. Our professional electricians handle all types of electrical work, including troubleshooting, control wiring, electrical outlet installation and circuit breaker repair. Our vans and trucks are kept well-stocked so that we can provide quick and efficient service to minimize your inconveniences. We will come to your home to diagnose and repair any electrical problem you may be having. We will do all your electrical work personally to guarantee an excellent job for you. All the electrical materials we install for your project will be the finest that are available. Plus, we treat your home and property as if it were our own, leaving nothing behind but an outstanding electrical job and your complete satisfaction.